Do you work for Confluence? "Confluence Used as an Internal Web Page"
Confluence's ability to quickly build up a webpage, save changes, add in elements including images and graphs, schedules and more, makes for a good collaborative solution for a team in production. Confluenced can be integrated to JIRA, and Hipchat as well, so communication is all in one area. No coding is required, simply start typing away and uploading images to make a live database. There is a limit to the configuration options of where text or image boxes can be placed. There are pre formatted designs to choose from, which might not be exactly what you are looking for. Be default if Confluence is integrated into JIRA then you can spam your team members any and all updates that you make. I believe this setting can be adjust I just haven't found it yet. If you can get the IT guy set up and hand some of the creative ability over to some right brained indivuduals, the potential of this software can really come together. Also for administrative, and management ideas, this software is another tool that is also sharable to the whole team to see. Currently information about clients and their needs is spread across emails, documents, and other software, Confluence brings all this info into once place that I can send a link to a co worker. This way is a good way to see visually when the timeline is set for a project, and where everything they need is located . Learning about Confluence? We can help. "Helping us internally to document all the different processes and procedures we have"
"Works as an efficient collaboration hub for our projects"
I like that Confluence from the same company as other great software I use, which allows me to switch to them easily. It's also a good place to store your documentation. I like the general layouts and spacing between various sections in project documents, which make it easy to absord the overall picture of what's going on and what needs to be done. Confluence has simple functionality that's easy to work with. It's almost like working with a standard text document. I don't quite like the way it handles writing new documentation. I feel like it should have a dropdown that allows you to write it in a format that you want to, such as markdown language. As of this moment, it has a bit of a simplistic feel to it which makes it difficult to write code snippets, which is something I would like to do in my documentation. As with most software, you should do your research for your particular requirements in message boards and review websites to find something that is friendly for writing documentation or whatever your needs are. Confluence has generally worked well for me though. Confluence has been an enjoyable hub for me to connect with peers about our current projects and planning events and other activities. The user interface is usually simple enough for our whole team to work with. Confluence enables all of us to be on the same page about tasks, deadlines and assignments so we can get things done properly, on time and with minimal wasted communication and direct file sharing. "A big platform to save and share information. " This is a big platform where save and share information with people around your business environment. I'm using daily at work and I think it's so useful to keep important information organizated. The most thing that I like about it's the possibility to save all kind of information and make it public or private for some groups. Also, it goes vinculate with your business mail, so you'll receive notices for any change that happen in your groups. The problem of the possibility of keep so many information is then it can be a little bit difficult to find all do you want. Sometimes, there are information that you need but you don't know or don't think about find it there. I recommend because the security and the capacity to save so many information. Also, It's an important and knowed tool by business work, so they have an important community. The benefits of using Confluence it's the awesome amount of quantity of files and information that you can store here. Confluence is a great solution for sharing documentation across a large network of employees. The permission options can be customized perfectly for various departments, from read only access to full editing permissions and more. Linking to Jira is hugely beneficial to tie documentation to actual pieces of work and everyone loves that feature. Chart formatting is rough. If you make a table and resize it in any direction, everything moves, gets jumbled around and no longer lines up. It's a massive nightmare. Also, something happens during the save state of tables, when its reopened, some cells get smaller and can no longer be edited, which absolutely stalls collaboration on documents across the company. This also causes embarrassment when presenting in front of key stakeholders and the software decides to develop a mind of its own. Confluence is great for storing, organizing, and sharing documentation across several employees. There isn't a great way to archive just yet, so if you have a lot of documentation, beware. Several pages and spaces will pile up and it can be hard to manage as your company grows. Seeing the page history helps in that manner, so you can delete or export spaces and pages you think are past their years of usefulness. 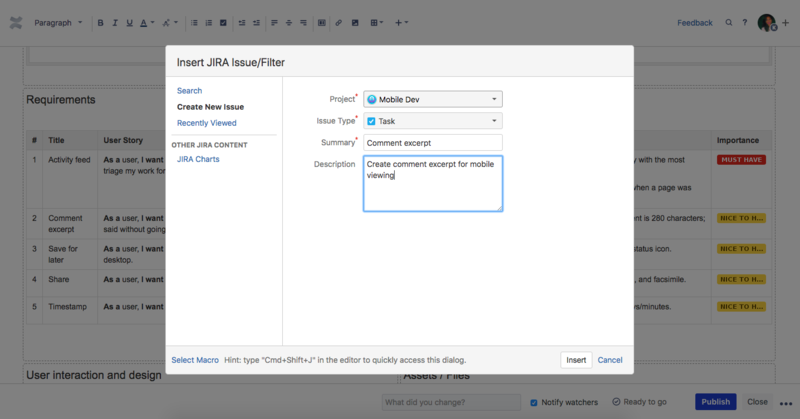 Linking Jira to Confluence is really handy for my company as we design software using agile. Our development work lives in Jira and all meeting notes and documentation lives in Confluence and everything ties across those 2 pieces of software really nicely and without much effort. Nesting in the side bar to keep everything organized is an appreciated feature. 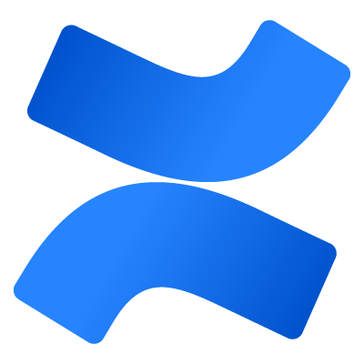 Confluence is a great integration with JIRA software. You can easily tag tickets to wiki-pages in Confluence and visa-versa. If you need a wiki that works into your JIRA software, you cannot beat it. It also allow for multiple people to be in a page at once. It's clunky. The wiki-editing is not super customizable and they often take features away. If I was not tied to JIRA, I would use other means of capturing the same data. Even a Google Doc is as good, if not better than Confluence is. If you are not a JIRA or Atlassian user, don't start with Confluence. It's much easier to document the same items in other tools. If you are a JIRA/Atlassian users, it's super helpful! Document our Common Design Language in a way that is easily accessible by all team members and to document UX work for the engineering teams clarity. I love how easy it is to create pages and adding widgets to make documentation much easier. Although it looks plain, it is consistent for documenting and collaborating with other teams. It also has a mobile app, but only new versions of Confluence are supported. I really don't like the limited tools to format text, tables, colors, etc. But I think this might be a good thing for users who try to make creative designs and bulky-looking pages. Confluence is not for websites. We could have easily created a Wordpress site and give everyone access to create pages and edits, but Confluence gives you the basics to get your documentation centralized. We used to put our internal documentation on Microsoft Word documents, then moved them to Google Docs. Eventually, we had so much information that it made more sense to create and internal website. Classic Google Sites was the next move and it worked out for a while. However, with Classic Google Sites going away and the New Google Site not to parity, Confluence was the answer to put all of our internal documentation in one place. 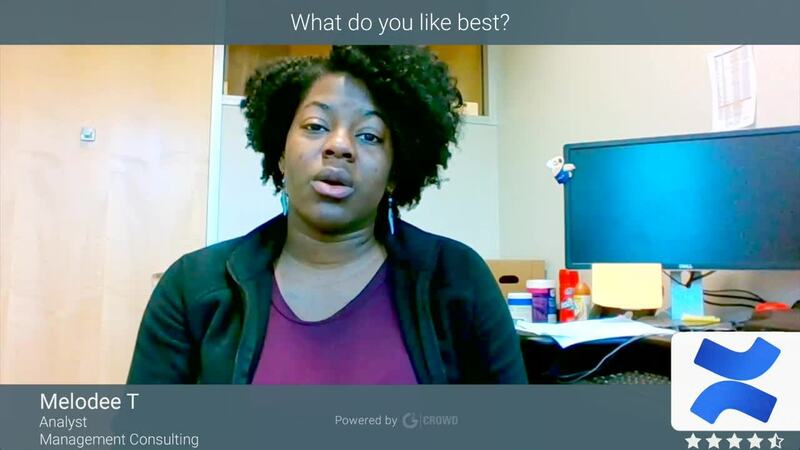 "Our preferred online meeting hub"
Confluence isn't overly technical with handfuls of windows and screens that pop up everywhere. The layout and interface design are similar to common documents we typically work on in our daily business. I like being able to communicate with my team about particular points, sections, designs and other elements directly in the document. I like that there are templates and design options for just about all our business needs such as meetings, business plans, press releases and emails. A particularly useful feature is the ability to connect Confluence with other platforms like Jira and Trello. Though I really like using Confluence, there are some team members that find it confusing and don't pick up on all the functionality and options right away. It may take some time for less tech savvy people to get a hang of. 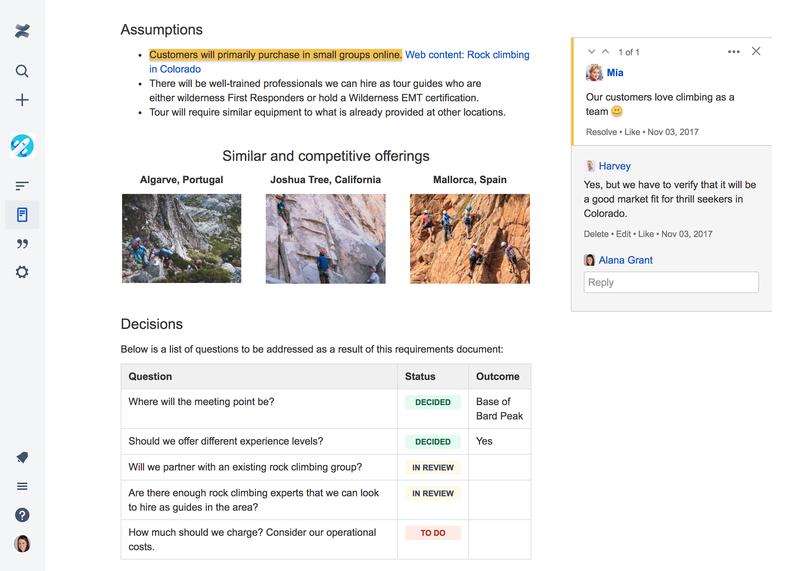 Confluence is solid collaboration platform that I'd highly recommend for throwing general ideas around or working on copy for business documents and marketing content. It's not the most effective for detailed collaborations, but it can definitely be a light and effective way to spark ideas and move projects and tasks forward. Confluence has a been an excellent collaboration platform for shaping ideas and planning out general strategies and wording for documents, projects and miscellaneous office activities. We don't have to worry about hosting and managing the platform since it's available in the cloud. It's very convenient to be able to access my account any computer device so I can stay up to date with activities at any given moment. I like that we can keep updating every document and also all the information is safe, Every team member have access to edit and share information is a good tool to keep everyone updated, I like that it provides different templates to create wikis and also the facility to connect every information and every document. It is not easy to start creating a document and also it takes time to get used to every feature, My major issue was transferring information from a different document since it does not provide you the option to merge two different documents and edit it like one. Searching for a wiki also is not that accurate and people who is not tech savvy at all will have a hard time. I recommend Confluence if you handle lots of information because its a space to keep the same safe and keep your team updated, however, you will need to invest some time to really master Confluence mostly if you are not tech savvy at all. most of all the sharing of information and creating our own "library" of wikis, everyone can contribute and its the best way since we are the ones in touch with our work tools, so editing and updating is an easy task to do. "Adaptable, easy to use collaborative space for sharing and document management"
"We use Confluence as our company-wide hub for information "
We use Confluence as our company-wide hub for information for every department: from sales collateral, to engineering documentation, to Product Usage Guides. We like it best because it integrates directly into JIRA, which is most helpful when maintaining a backlog or roadmap for others to view and see as we can link it to tickets, and it also has integrations with Balsamic and Aha, which we also found helpful to directly embed wireframes and flowcharts. Confluence wasn't made to be a sales tool, but now that they've engrained themselves in many companies' workflows for Product & Engineering documentation, it's easier for organizations to use it for everything. It needs a lot of improvements to be a better tool to house Sales collateral, one-sheets, powerpoints, and things like "Customer FAQ". They can support that now but not in a way that is marketing forward, so because it's not as flashy sales doesn't love using it. I would love if they can have more "slide share" type features so users can view presentations in the UI vs downloading, a better page template for FAQs so it's easier to search by topic and make it easier to search for documents or attachments. Confluence has become a widespread tool across so many organizations in the Tech/ Ad Tech/ Martech world, so knowledge of it will be greatly helpful to you as you continue your career. Using Confluence and Knowledge of the platform has become a "no brainer", where it's almost table-stakes skillset vs even listed as a requirement. If you are using JIRA for dev or product management, Confluence is a must have for any org! Confluence has allowed us to solve for information sharing across the org, collaboration, and organization. We use it to plan for upcoming projects and roadmap planning, linking it to JIRA tickets & Epics, as well as storing usage guides, and documentation on existing products. We have really seen communication amongst teams increase since we started using it, and it's a huge reference tool for me as a manager to keep tabs on what my team is up to. "Still a little difficult and messy looking but for the most part I like using it"
"hmm, would I recommend Confluence? No. Would I want to get rid of it? No..."
The ability to very quickly put a few bits of information together and make them available to my entire organization is priceless, especially using a tool that easily allows my peers to contribute and evolve my initial work. Cutting and pasting code onto a page? I always use the same settings with the Code Block macro. Please let me save these settings as a default so I don't have to re-select them every time. ). Make a decision on how spaces will be used at the very begining. My recommendation? A single space for your entire company. There is no need to segregate the information into the silos that spaces create. Does confluence frustrate me? Yes. Would I get rid of its wiki-like ability to provide information to my company in a quick low friction format? Never. (I just want less friction in a few key areas). "After learning it's a great tool!" With confluence I love how it gathers everything in one area, it makes it very easy when I am working to gather all tools so I can have access to everything in one place. It makes communication easier for all of my team members and I to come through and collaborate on projects, difficult cases, support cases, and even sometimes training, It can put everyone on the same page. Logging into Confluence if you have any type of security is somewhat difficult and doesn't always take the first time around. Sometimes after you log in it takes a bit long or it may not even log in at all and you have to completely exit out of the program and try to get back in. This makes it somewhat difficult when trying to log in for a case or what you're doing in time sensitive. Better your log in processes other than that I love your product! This is a huge time saver for me. I have to access a lot of information in a lot of different areas all very quickly and this allows me to have everything in one place putting it always within easy reach. It makes communication easier for all of my team members and I to come through and collaborate on projects, difficult cases, support cases, and even sometimes training, It can put everyone on the same page. "Excellent tool to share and track projects and goals for large or small groups." User friendly. A very straight forward tool that allows teams to collaborate in real time. A glorified Sharepoint...and then some!!! We use this tool enterprise wide and it is very effective in allowing us to accomplish our day to day work as well as larger scale objectives. Although we have the ability to continue to use Sharepoint, this tool is much more effective. Occasionally adding in macros can be difficult. Several macros have name so similar that it causes confusion as to which is the correct. Also had an issue when the way to edit was switch to Atlassian editor and lost the majority of our database of users for an enterprise wide tool tracking. Also, we might like more information as to how to use Confluence as a ticket tracking system for users who have issues with elements that are part of our enterprise. Submitting a ticket for issues that we have not been able to locate in the online help tool is difficult to do. The first time I attempted to submit a ticket for help, I did not find the link for almost an hour. Once I did, response was quick. Straight forward. Allow to track and monitor project status, ideas creation tracking, etc. The list could go on and on. Planning, goals, enterprise wide efforts. We track it all and are able to collaborate in real time. Saves us a ton of time. "New forms of online collaboration"
As soon as you enter Confluence, you realize that they have dedicated themselves to explaining enough for you to understand everything perfectly. Confluence is a software that allows you to work online with different teams of your company. I am the head of Software and it is very useful to have tools like this, since you can work in groups in the same project. On the other hand, it is very visual, it allows the implementation of images, videos, which makes it easier to collaborate with projects that involve more visual aspects. Confluence does not have anything to consider really negative, I think it is an application with a simple and careful interface. The only thing that could perhaps improve would be to add more styles within the program, but otherwise, I have no complaints about this program. If you want your team and your project to be more competitive and go everything much more quickly, clearly and concisely, you should think about having a program like this. Teamwork tools such as Confluence generate a better division of labor and a simple division of roles. Within very large projects there will always be different teams that have to do different activities, therefore, confluence, allows images, videos, texts, that are modified, that those changes are communicated to the rest of the members and also allows you to be aware of any novelty introduced in the project. Any team will work better and will improve their productivity by having a teamwork tool like this one. "A new "wikipedia" at our workplace "
We have been using confluence from past many years in our organization and I have seen the importance of Confluence. It is wikipedia in our organization and if we need anything to know about any application, Confluence is the only place to have the knowledge base. Its a library in our organization to have known all the things. Confluence sometimes act weird where it doesn't update the edits we do on page. This allows us to work with the Admins and look around for the issues that's happening to Confluence and if required raise a ticket against Atlassian. Also, the UI is little old and quite too simple.May be they can work on enhancements and add some new features and integrate with other tools too. We have realized a lot of benefits with Confluence such as a good knowledge base of our organization. This helps a lot of new joiners to just browse through Confluence pages and get the insight of our organization/projects that are they going to work on. My team is currently considering Confluence as an internal method of working on projects and collaborating. Since we support a lot of different products and devices for multiple customers, our daily routine consists of following a lot of different procedures and directives. We work in an environment where a lot of instructions, images and videos are being exchanged in order to resolve specific customer problem. 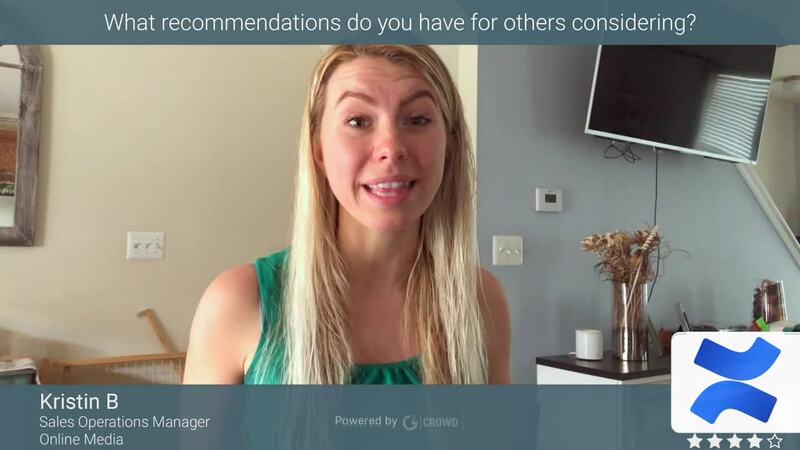 While skype for business is helpful when you need to send a short instruction or an image or two, it isn’t that practical for more elaborate cooperation or project. That’s where Confluence steps in. It provides a space for teams to collaborate, share content, ideas and even write knowledge base articles. It is basically a cloud service, meeting space, social platform and a knowledge base. It combines all of that into one centralized platform which speeds up and makes team collaboration easier and more interesting. The pricing plan is somewhat steep when compared to other solutions. In theory, Sharepoint offers almost the same things, but somehow Confluence feels better adn it's more practical for users. "We've Been Using Confluence for Years"
We use Confluence in a very simple way - to share information. And it's very effective for this purpose. Confluence - as part of the whole Atlassian ecosystem - is a very powerful tool with TONS of features. We probably use 5% of what it can really do - and that's enough for us, and even at that level we still find it to be cost effective. Because we only use a small portion of the Confluence toolkit, the user interface can be a bit heavy for our purposes. It might be nice if we could toggle to a simpler version where we could strip away a lot of the UI that we don't use. I would definitely consider Confluence for information sharing in an organization. I believe that the bigger your organization, the more you will get out of it. And if you use multiple Atlassian modules together (e.g. Confluence with Jira) - the value increases even more. As always - consider other options on the market. But we've always like Confluence enough that we haven't evaluated competing products in a long time. We use Confluence primarily for internal information sharing and document reference/archive. We work better as a team when using this tool, and we know we can always find that "great idea" or important bit of information when we need it. "Handy "wiki" like tool for documentation, runbooks, project statuses etc." It is very easy to share updates on articles that you want to share with people who follow that article, folder or space (which is the name what Confluence uses for example to separate HR, Marketing, Customer Support etc. areas). Also the editing features for articles are quite easy to use and sufficient for many different purposes. One other thing worth mentioning is their option for creating template files. This feature comes in handy if for example you have recurring meetings for which you have certain topics that you go through every time. Menu structures and usability aren't the best. I'd like to see more customisation options on the menu structure and it's size, especially when you have longer names for folders, files etc. It is not bad by any means but a bit frustrating when you cannot see the whole name of the folder for example. Runbooks and other guides are very well organised and updated with Confluence. "Confluence - The power of the simple"
Collaboration is nowadays key to success. Confluence makes it simple by being a cloud tool that empowers your teams to create their own content and flavor it with multiple out-of-the-box plug-ins and templates. Is a great complement to your JIRA deployment and most of the integrations between both platforms work pretty seamlessly. There's also plenty of third-party plug-ins that are handy for integrating specialized content like design models. The notifications system is also great when you're tracking the progress of a specific article or document. The cloud platform is rather slow. Atlassian has improved it lately but is still somehow annoying enough. Migrations from Sharepoint are painful. I've seen companies desisting on Confluence as there's no easy path for them to migrate. In general, Atlassian should work on achieving MS Office interoperability with their tool suite. Confluence is best for teams starting afresh. But late adoption is also possible. If you're starting an agile practice and using JIRA, don't be afraid and embrace Confluence as well. As with any CMS, define a content structure that matches the needs of your team/process; avoid having a documentation extravaganza by setting some rules of engagement from the start. Knowledgebase, meetings minute taking, project documentation, requirements management, internal article publishing, ideation processes, solution designs. "An excellent way to organize your project"
It is very easy to use, very easy to configure, very easy to understand the first time you get in touch with it. You can organize all the aspects of a project and make it available for everyone. It is ideal to create reference guides, components descriptions and different types of resources for the members of your team. It allows you to set up different levels of access so not all users can access all the information. You can also customize the visual aspects of the platform according to your needs. At my job, we use it to store relevant information for all the users related to the project we are working on. For example, there's a general description of the project, its components, the tools it is liked to, and we have created a reference guide, in which a description of all the components from our platform and how they are built and supposed to behave can be found. Since we use agile methodologies, we also update the outcomings from the different meetings, the goals proposed and the results achieved. We also have calendars in which the days off from the team members are marked so other team members can check the information. That way when someone needs any kind of information related to the projects or its team members, it can be found in this amazing tool. "A great knowledge base for most corporate unlike Sharepoint based services"
It is really easy to store and view data and refer materials as and when required for internal uses. I love the overall user interface as it seems really easy to use. I have used Sharepoint based services (SBS) previously, however, this seems to be a really simple and great tool. The provisions for others to comment, like and share the knowledge base with other members/resources makes this application really flexible. There are additional provisions like Save for later, watch or share the articles through different mediums. There could be more add-ons or integrations within the tool like notifying users if there is a section update or so. Nothing personally I dislike up to now as its just been a month evaluating and using this tool. It is really easy to view documents and materials for internal references or similar. "Great Wiki Solution For Documentation and Team Collaboration"
I dislike the the complexity of setup for hosting Confluence On prem. One of the hardest aspects of the set-up was configuring the Synchrony server. It is responsible for powering the real time editing plugin that many users benefit from. Also I dislike the complexity of the layouts when editing spaces. By this i mean navigating through already existing children displays and other Macros that may be embedded within various wiki pages. I would say that the business problem we are trying to solve is to put all relevant company information across all departments in one place where everyone can access it. 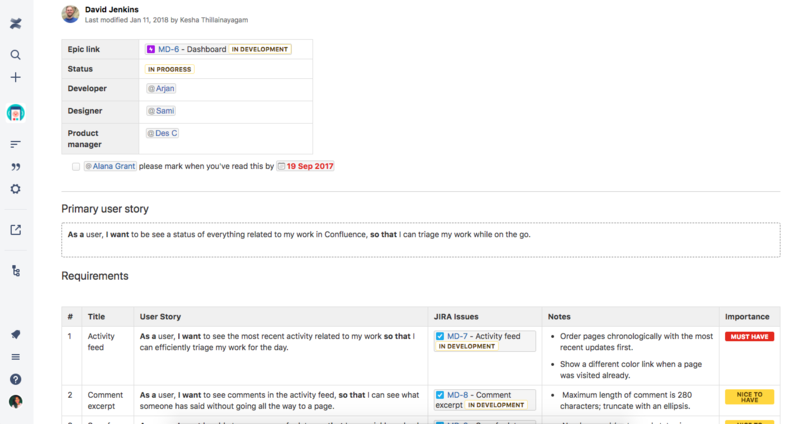 I have also realized that when using confluence in conjunction with Jira, you can boost productivity by linking tasks you are working on in Jira directly on wiki pages that you create. This allows users to quickly jump between Confluence and Jira. "Perfect Interconnectivity with Jira "
If you use Jira for as your issue management system, you should take the time to learn the in-and-outs of confluence. Confluence gives non-technical employees the ability to create beautifully formatted external or internal facing sites, with the option to pull in data from external sources. What I like best? Enough design customization to make it feel in-line with your style guide but not too much to make the process overwhelming. The end result is a gorgeous site that is easy for anyone to maintain and keep up to date. I would say the biggest flaw in Confluence is the same flaw in Jira, user management can be a big pain. With the concept or users being tied to 'projects' it can be difficult to understand why one user is able to access contents while a user with similar access cannot. This lies at the project level when IMO it should be settable at the global level. It's pretty obvious... Jira. If you dont use Jira, consider it. If you use Jira, use Confluence. Our main usage of confluence is as a Wiki for our different applications and users. Confluence provides us with the ability to manages these resources in a way that is logical for all of our user-bases. One of the big benefits we didn't realize when we initially signed up for the product was the ability to include downloadable content (PDFs, Excels, etc.). "Confluence- a handful tool for sharing insight on anything business"
What I like best in Confluence is the fact it is easy to share documents using the links- which can be made short too! A big pro is that you can set a page/document to be accessible or not by someone depending on whether they have logged in or what are their login roles. Nothing in particular, just the UI could do with an improvement as it looks a bit old fashioned- not using the latest version though so that might be a thing! You may definitely use this product for sharing documents and guides for people as your clients and your partners. You will find especially useful to create linking between each guide. Give some time to the administrator and the manager handling this to get around the lots of features that Confluence offers. You will find handy that pressing the letter while on any confluence page pops up a window with links to that page, on of them being a shortlink. You can then save yourself on a text or as browser bookmarks the most useful or commonly used links and in that way have them accessible much faster. We share all sorts of documentation and guides with customers and partners. We also store insight for only within company use, even thought as of lately we try to move from confluence for that particular use, as we build another page for this. Overall this a decent wiki for capturing information and sharing among the team and the company as a whole. In general it does the job without getting in the way allowing me to just dump thoughts on paper and move on. By being extensible, it makes the presentation even easier. It can sometimes get sluggish and have some issues requiring a reboot of the system. The share option takes another step or two when wanting to send someone a quick link to what you are working on. After having seen the note on how to bring up the share link dialog even when I brought it up using the given key sequence, that doesn't appear to work anymore making me have to resort to the mouse and a pull down menu. Have a plan organizing at the start to try and prevent bloat and disparate content. Sharing of information across three sites has become fairly simple with Confluence. We also use JIRA and hipchat which allows a bit of cross pollination so to speak creating a decent overall environment. Confluence offers a great product for documenting, and planning your work. If there is something you need to do, chances are you can do it in Confluence. With such a large arrangement of features, the Interface can be confusing at times. You are often supplied with a large section of options, each with additional options, and without spending a fair amount of time researching they may still not help. If you are looking for a generalized solution for your documentation and planning Confluence can help! It will take a bit of work to get everything just the way you like it, but when its all put together, you will have the documentation you have always dreamed of. We are working to create full documentation for our IT Department. Having this information readily available has been a fantastic improvement to our workflow and efficiency. "Great platform to share and communicate information to a group of people." Easy to access, navigate, and grant access to. Sometimes the groups and the users relationship to the groups can become confusing. And sometimes it takes some digging to figure out which group you should be adding or a removing a user from. The administrator interface could be a bit easier to navigate. It can get a little confusing when assigning users to groups, or trying to issue the correct permissions for each project. Solving the issue of everyone that is not in the same location will have the the same information and access to the information that should be shared amongst a team. the benefits that i have noticed is that teams are able to keep up with one another and make group decisions based on the same information. "Handy space for team collaboration"
Simplicity of creating new spaces - no complex user management. 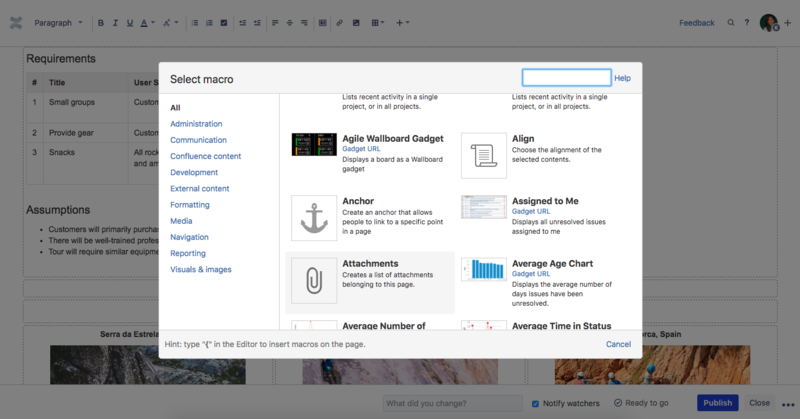 Additional features like formatting and adding macros move work with Confluence to next level. Great variability with plugins (free or commercial) you can download from Atlassian marketplace. 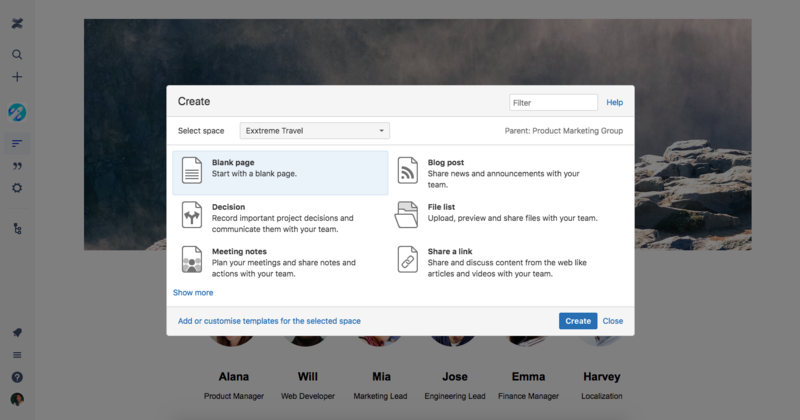 With last update Confluence introduced online editing feature - so team can collaborate online on one document together. Sometimes formatting goes wrong when using IE browser, but it depends on you company browser policy and settings that are allowed. UX might be slightly user friendly - but it gets better over time and small steps towards neat UX are made with each update. As content grows it´s important to pay attention to content governance a keep you documents, spaces and pages organized. If you are using lots of plugins pay attention to their pricing condition. Very often the vendors changing from free to pay model. Apps / plugins are billed based on the number of users in your host product (Confluence). Confluence is great as wiki team space or shared space for DEV documentation. Previously we used Confluence as unofficial intranet sites. You can easily create project page or canvas and share it quickly to project participants. "Good features, but can be hard to navigate"
Easy to have large teams all report on work and to have a time line. Easy to insert various media to show plots and graphs/tables/records etc. This is very convenient for our team of 30 people, of which maybe a handful may have large updates/presentations, whereas others might have just text or a graph or two. Navigating the pages seems quite difficult. To find certain pages, is quite a chore, especially because the search functionality seems limited in its capability to hone in on a certain page. Finding a child page can also be hard to search for unless you know the exact title. Furthermore, the feature 'notify watchers' seems to always be checked by default. For a team of 30 people, this can cause quite a lot of spam as we use confluence for our weekly meetings. If one really wanted this feature, they would check the box. If I am not trying to send a miniscule update to everyone on my team, I often forget to UNCHECK this box. It's a decent content management system, however simple things a s a google doc or evernote sheet are much lower barrier to entry if you don't need many of the extra features. Keeping lasting records of meetings to give an account of work to make compiling reports for higher ups easier. Moreso, being able to try to find old presentations given at meetings in previous weeks. This makes it easy to look back on a cool result or feature presented much later down the line, or look at when performing up follow up works. I use the Confluence applications on a regular basis for my work and there are several things that I like about them. The mobile applications provide a nice variety of tools that most companies could find to be beneficial. At the start of your use of the Confluence mobile applications you'll have all of the tools that are necessary to expand extensions and plugins. The Confluence mobile applications are extremely well compatible with each other - they can be used simultaneously - making it convenient for developers who need to have everything connected. The Confluence website! Good thing Confluence has reliable mobile applications because the Confluence website is always down! I find it super frustrating when working on my desktop computer and needing to access Confluence because 50 percent of the time, the website isn't working and I can't access my site. When I am able to access my site via the Confluence website, it is often very slow - I often have to reopen Confluence website - which also takes some amount of time to do. I recommend that you have a plan for the structure of a project before you start to use Confluence. This will makes things much easier and run smoother. I recommend Confluence for large companies as it will make collaboration much easier and more efficient. Confluence enables easy collaboration with my coworkers on things like documentation as we start a new topic or working with building a new product. It has made this collaboration easy and convenient. The Confluence e-mail notification feature has also been great because it makes users aware of situations that are important. Confluence makes our daily routine simple and allows us to be more productive because it solves issues that occur on a specific day. I have found Confluence to be helpful in all different kinds of projects. "Great resource for creating internal knowledge base articles"
Customizability in creating page "templates" from which to build knowledge base articles, including imagery, stylized text, and even files and attachments. Sometimes finding the articles that i created can be sort of difficult; a way to index articles so I can find them would be nice. If you're creating a knowledge base of articles, make sure you have a way to find knowledge quickly, or the whole thing is for not. Make article titles that are relevant; make use of the 'labels' for easy search results. As a provider of IT services, we have alot of high-tech situations that require documentation. Perhaps we're looking to employ a solution we built in the past for a different customer, or just create an article about an incident managment that will allow us to brief ourselves on what we did. Confluence allows us to create an internal knowledge base with easy to read articles for just that. No markup required with excellent copy-paste support for images. This reduces the barrier of creation for non-tech oriented disciplines like art and design. I also like how the parent-child relationship between pages is virtual to the point that you can programmatically display all children of a page as well as reparent any page to a different parent. Some of the widgets can cause issues with web page formatting, such as cutting the page in half with a scrollbar on top half. Hopefully, those bugs get resolved soon. They have also recently eliminated the option of showing the site tree in the sidebar, which makes it difficult to internalize how the pages are organized. We have had to work around this by creating a specific link to the site tree on the front page. Also, 2FA is part of a separate package that you're expected to pay extra for. We use Atlassian's cloud service for minimal IT risk and hassle, which costs a monthly fee per bucket of users. We have pages full of screenshots ready to link to whenever somebody asks the question "How do you do X?". We even have our Slackbot linking to those pages whenever you ask specific questions on Slack. This reduces the amount of overhead wasted on asking the same questions over and over and waiting for answers to those previously answered questions. We use this tool in our IT Technology department because is a great collaboration tool. We have divided the tool for departments and we create groups in order to give access to the employees to the section that they need to access for the information. We have a lot of manuals, videos, trainigs...Is the best Knowledge management Tool. You have a lot of information and you only have access in the section that you have permissions and if you need to access to a manual that you have the information, you need to request this permissions and you loose time in this action. We have all the manuals and the information in a site that you can access where ever you are, you don't need to spend time in trainings and if you have a problem you can see the solution in confluence.